Cutaxyl is a mix of quite popular steroids and at the same time useful in the practice of sports and beyond: Trenbolone Acetate (50 mg), Drostanolone Propionate (50 mg) and Testosterone Propionate (50 mg). Its main features can be identified with high anabolic and androgenic power, moderately long, rapid and uniform exposure (drug starts already in the first days following injection, while duration of its activity is to 2-3 days). This mix is used mainly in sports practice. Athletes disciplines such as weightlifting, bodybuilding, power sports, etc., apply it for quality growth, lean body mass, increase strength, endurance and many other indicators. Note that for the rapid and uniform action of Cutaxyl, as well as the effects exhibited by it during the cyclem meets the competent combination of steroids it is based. The first – is Trenbolone Acetate (activity 1-3 days), contributing to an increase in lean muscle mass, strength, libido, insulin-like growth factor (IGF-1) and the burning of fat. Second – Drostanolone Propionate (activity – 2-3 days). The effect of this steroid is the rapid increase in the density of muscles and relief, as well as augmentation of the power indicators and in burning fat. The third steroid – Testosterone Propionate (active for 2-3 days). Its use also results in improved relief, stiffness of muscles, to increase strength and fat burning. Plus, as Trenbolone Acetate, during the course of it can increase the libido and sexual activity athlete. In general, on cycle of Cutaxyl from Kalpa Pharmaceuticals appears multiple positive effects. It has a positive effect on the bump and muscle density (burning fat and water retention in the body), whereby muscles appear hard and elastic, leads to muscle growth, endurance, IGF-1, libido, strength and other indicators that are useful not only in sports practice. Cutaxyl dosage is 150-450 mg/day. 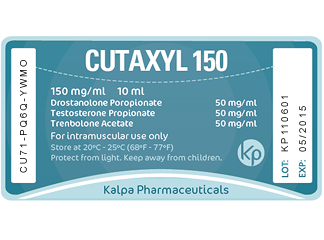 Cutaxyl 150 should be taken exclusively by male athletes, and all because women using it on the cycle, may face with masculinization caused by high androgenic activity. Masculinization – is the accumulation and development of secondary sexual characteristics of male: deepening of the voice, increased rates of hair growth on the body and face, increased aggressiveness and so on. However, men should no lose vigilance too. After all, during their reception of Cutaxyl, may disturb androgenic side effects: acne, increased aggression, increased oily skin, suppression of natural testosterone and some others.